Do your research ahead of time, make a plan, and execute with confidence... Sound like a sailboat race? It's important to apply those same ideas to your big picture campaign to improve as quickly as possible. Make a plan for improvement ahead of time and you'll be taking a shortcut to the top. Want to get the straight-talk explanation of what it takes to get to the top of the fleet? You're in the right place! Connect with a local fleet in your area, and ask to go for a ride: The skiff fleet is all about community and as such, most fleets and teams will be more than happy to help get your sailor on the water for an afternoon to find out what skiff sailing is all about. If you know of a skiff sailor in your area, ask to go for a ride in the afternoon with a more experienced skiffy, and you'll probably be welcomed with enthusiasm! Look for an "Intro Clinic" in your area: Intro clinics are designed to get new sailors onto the unstable surfboard of a boat for a weekend long immersion into skiff sailing. By rotating sailors through the boats, we ensure that everyone gets a taste of speed without getting exhausted. Time spent on the coach boat is great for seeing the drills from a different angle, listening to the coach feedback, and getting to ask questions in real time. Ride along in the coach boat at a clinic: If you can't find a way to get sailing, the next best thing is to ride along to catch the action from a motor boat. Depending on the boat and the event, this may or may not work out, but it's always worth asking! Be sure to bring sailing gear incase there's a moment to sneak you in at the end of the day! 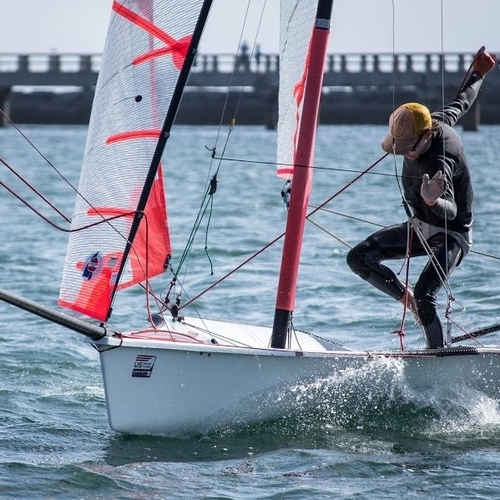 Whether you're looking to dabble in the 29er while you finish up a year of Opti or Sabot sailing, or you're ready to dive in head first, the goals below will help you take the right steps to kick off your skiff sailing career on the right foot. If you're starting out in the 29er and your plan is to dabble in the skiff while you finish out your commitments in another class, you should expect to spend a while getting past the steep initial learning curve, but there are a number of things that you should Try consider to help keep the intro to the boat fun and productive. Find a local skiff program, and ask to go for a ride with a more experienced 29er sailor. Sign up for a Beginner Clinic in your area. Don't go on the water without a plan; get fun, unique, productive drill ideas at the link below. So you've bought a boat, and you're looking to get on the water and get racing at local events as soon as possible; here are a few things that can help ensure that your first racing experience is a positive one. 70/30, training/racing ratio - make sure you're putting the practice time in before racing! Plan your training approach for the next few months using an hours tracker. Find or organize a local training group with your friends. Get coaching at a regional clinic using the link below. If you know that the 29er is the boat for you, and you're hungry to get to the top as quickly as possible, there are three main things that you can do to reach the top as quickly as possible. Sign up for the full regional program in your region, and consider traveling to a nearby region for even more coaching. Want more resources to help you start your skiff career on the right foot? Check back in here for more resources soon! Once you develop a foundation of skills, and you test those skills out at a regatta or two, it's time to start thinking about taking your game to the national stage. Go on to the next goal to find out about the Big Four national events.